Trusting God. Why is it so hard to trust Him? Can I just be honest here? Could it be that we do not trust God because we do not REALLY know Him? Trust is built through spending time with one another, watching how that person reacts to your faults and failures and them doing the same with you. When I first got married 13 years ago I trusted my husband enough to say “I do” but as we began to live together it became more and more apparent how much i really didn’t trust him. It was not because he had ever done anything to make me not trust him, he hadn’t had enough time to do that, it was just that I didn’t really know him well enough to know if I could trust him. I based a lot of my ability to trust him on my past ability to trust others and while that was completely unfair to him, it was completely natural. Now, fast forward 13 years...I trust my husband more than I have ever trusted anyone on earth. But, why is that? It is because I have spent so much time getting to know him. And through all of the ups and downs he has shown me that he can be trusted. He isn’t perfect, but when he messes up he has always had the humility to come to me apologize and then genuinely strive to do better. I don’t really believe trusting God is much different. If we spend time with Him in His Word and in prayer, we can get to know Him, and as we get to know Him more, we trust Him more. There are depths and facets of God that I will never know this side of Heaven. There are things about Him that my mind can not even begin to comprehend. But, He has revealed SO much about Himself in His creation and in His Word that we can most certainly know Him well enough to trust Him. So, I go back to my original thought. Could it be that we do not trust Him because we really do not know Him? What is the area that you struggle with trusting God? Your job? Your health? Your children? Your marriage? Your finances? Or maybe it is even that you do not trust that there is even really a God in the first place. Or if there is a God, do you lack trust is knowing that He truly cares about you? I would encourage you, whatever the area you lack trust in God, pursue Him in that area. He has promised in His Word, “Seek me and you will find me, when you seek me with all of your heart.” Jeremiah 29:13. I don’t write this because I have somehow reached this level of perfect trust in God. I struggle with trusting Him all of the time. I just want you to know that if you struggle too, you are not alone. But what I am learning is this: the more I know Him, the more I will trust Him. My hearts aches today. Actually, my heart aches almost every day. Some days are worse than others, and that day would be today. My heart aches for people in our country, and around the world, who do not know TRUE freedom. Not the freedom that comes with a war that is waged or won, or the passing of a law, or the election of a new leader, but the freedom that settles on your heart when you realize that the God of the universe loves you passionately, persues you relentlessly, and set you free from the curse of sin and death. My heart aches for the people around me who are fighting for their lives or who are fervently fighting through prayer for the life of someone they love. My heart aches for my children whom I pray everyday will not just be believers in Jesus but follow Him with all of their hearts, no matter where that may take them. My heart aches for children, and even adults, who do not know the true love of earthly parents and therefore cannot even begin to fathom the love of God. My hearts aches over bad decisions that I have made in the past, but also as recent as today, that carry with them consequences that break my heart. My heart aches for missed opportunites because we are sqandering our time and money on temporal things that have no eternal value. My heart aches, and aches, and aches. AND THEN, my heart is comforted. Comforted by the truth of God's Word. Psalm 9:9 - The Lord is a refuge for the oppressed a stronghold in times of trouble. 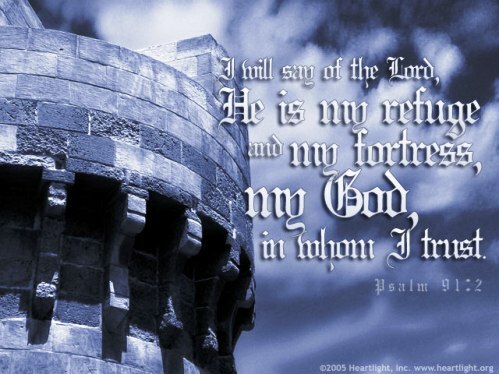 Psalm 18:2 - The Lord is my rock, my fortress and my deliverer; my God is my rock, in whom I take refuge. He is my shield and the horn of my salvation, my stronghold. Psalm 22:24 - For he has not despised or disdained the suffering of the afflicted one; he has not hidden his face from him, but has listened to his cry for help. Psalm 27:14 - Wait for the Lord; be strong and take heart and wait for the Lord. Psalm 37:24 - Though he stumbles, he will not fall, for the Lord upholds him with his hand. Psalm 46:1-3 - God is our refuge and strength, and ever-present help in trouble. Therefore we will not fear though the earth will give way and the mountains fall into the heart of the sea, though its waters roar and foam and the mountains quake with their surging. Psalm 138:7 - Though I walk in the midst of trouble, you preserve my life; you stretch out your hand against the anger of my foes, with your right hand you save me. Psalm 55:22 - Cast your cares on the Lord and he will sustain you; he will never let the righteous fall. John 16:33 - "I have told you these things, so that in me you may have peace. In this world you will have trouble. But take heart! I have overcome the world." 2 Corinthians 1:5 - For just as the sufferings of Christ flow over into our lives, so also through Christ our comfort overflows. Lamentations 3:31-33 - For men are not cast off by the Lord for ever. Though he brings grief, he will show compassion, so great is his unfailing love. For he does not willingly bring affliction or grief to the children of men. I pray if your heart aches today that it is comforted by these truth's also.